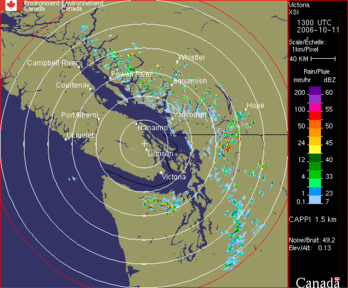 Weather RADAR measures the size and number of water droplets in the atmosphere as well as rainfall rates. These images, taken by satellite in geosynchronos orbit, show clouds in visible and infrared light. 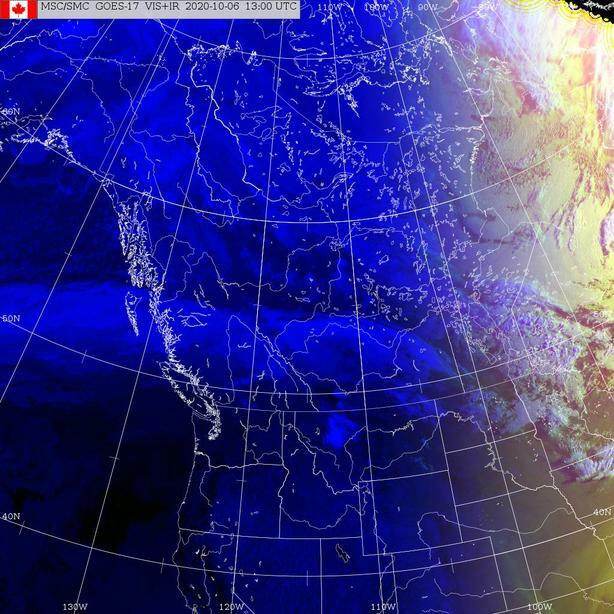 More satellite imagery of North America, the Atlantic and Pacific Oceans is also available from Environment Canada. Analysis charts are the weather forecasters tool for showing current and forecast weather conditions. With training and experience, you can learn to make forecasts from these charts. This map shows current conditions across Canada in a form that is easier to interepret than the analysis charts. This chart shows a prediction of when it will be cloudy or clear for the next two days. It is based on Environment Canada weather forecasts and is a product designed to assist astronomical observers determine when viewing will be best. This page took 2.2 ms to generate. Last Modified: February 13 2012 15:36:46.